Calculating how much office space your business needs is not an exact science—though, unfortunately, you may feel the need to come up with an exact number. A real estate agent will often ask you your requirements in terms of square feet, which he uses as a relative measurement of which properties on the market are eligible for consideration. In addition to square footage, he might also ask you for the number of permanent offices or rooms you'll require. Space requirements can vary tremendously by company, by industry, and even by geographic area (think space-pressed Manhattan vs. spread-out Houston, for example). And then there's the significant matter of office style. At one end of the spectrum—much in vogue these days—is the open space plan, which has no private offices: Everyone sits together, in one large room, in cubicle clusters or at tables. 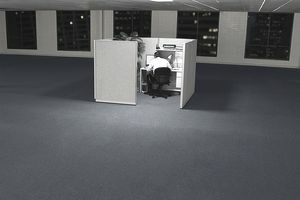 At the opposite end of the continuum is the traditional hard-wall layout, full of private offices, large conference rooms, and support rooms such as libraries, kitchens, and file rooms; though not as hip, professions requiring privacy and confidentiality—law firms and financial institutions, for example—prefer this sort of workplace. You have to decide what variety of layout suits your business best: open space, closed space, or a combination of both. The estimates provided below are average space requirements—the number of square feet per person or function that's typical at most companies. Consider them rules of thumb. Each can be individually adjusted upward to provide a more spacious layout or downward to provide a more efficient use of office space. Don't forget to think of other specialty areas particular to your operations. If you have advanced technological needs, you might require a room for computers or servers, for example. Ask your real estate agent how much the space costs per square foot. This could help you determine your most important needs, and make sure the space where you desire to re-establish your business is also cost-effective. Don't forget that you will be purchasing or signing a lease that will lock you into this office space for at least two to five years. Therefore, add 10 percent to 20 percent to the total square footage that you calculated to accommodate future growth. Remember that the additional expense of terminating a lease early and the cost of moving an office after only a short period of time will be more than offset by having this additional space in reserve waiting to be used.